This year’s World Cup has been full of inspiring Cinderella stories and jaw-dropping upsets. But of all the players making an impact this year, the one with the most long-term impact may very well be mobile. The Russia games are the latest – and greatest – major spectator event to show that device-driven viewing is on the rise when it comes to live sports. Usage and mobile-viewing was already showing an increase earlier this year, for major events like the Super Bowl and the Olympics. The World Cup has made it clear that this trend is here to stay. The usage data shows just how massive consumers’ appetites are for live-streamed sports. T-Mobile’s network saw unprecedented spikes in streaming traffic on days there were matches. For instance, when Croatia upset Argentina 0-3 on June 21, traffic was up 150% of normal usage. When Croatia squeezed out England in extra time of the semi-finals July 11, the spike was 130% of normal. Sunday’s final, in which France beat Croatia 4-2 – with six total goals, it was the highest-scoring championship match since England’s 4-2 win over West Germany in 1966 – delivered a traffic spike of 110%. Days with multiple matches saw similar or even higher spikes, as on June 27 when there were simultaneous games: South Korea vs. Germany and Mexico vs. Sweden. Not only did T-Mobile see a staggering 180% boost over normal activity, it measured a record-setting 1.1 Tbps (terabits per second) of data traffic. 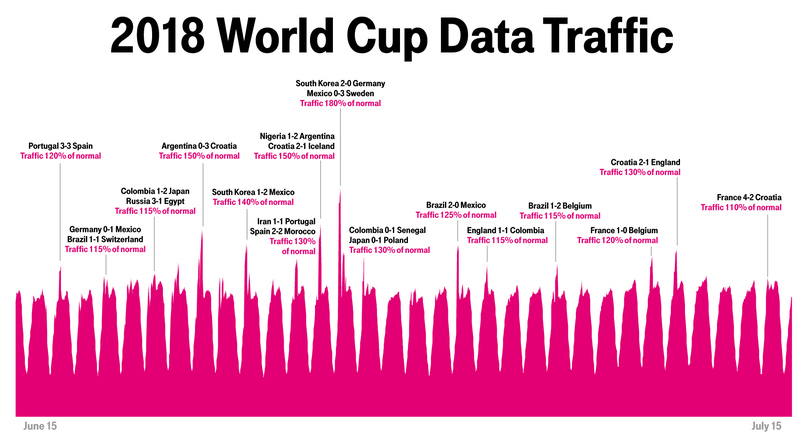 T-Mobile saw huge traffic spikes almost every day of the World Cup. Above are particularly noteworthy matches, many of which featured Spanish-speaking teams. Download image. The mobile-viewing trend appears to be especially true for Spanish-speakers in the U.S. – 50-million-plus people – who are inclined to choose it as their go-to streaming option. Equally amazing is that when the World Cup started on June 14, there were about 500K downloads of the Telemundo Deportes En Vivo app. By tournament's end, there were almost 4.5 million. Which helps explain Telemundo’s record-breaking day of livestreams during that Sweden-Mexico match, when they registered just over a million concurrent livestreamers at one time, driven in large part by their mobile audience. “We’re just seeing that these games really have been a watershed moment for folks in the U.S.,” says Blacker. A mobile moment, pointing to an evermore mobile future.